Just in time to start planning your visit to the 2015 Epcot International Food and Wine Festival the Disney Food Blog has launched its newest food guide. The ‘DFB Guide to the 2015 Epcot International Food & Wine Festival‘ e-book is more than 250 pages of full color photos, menus, reviews, and more to help you plan your Food and Wine visit. The e-book also includes a daily schedule of events for every single day of the festival in addition to a printable World Showcase Booth Menus Checklist, World Showcase themed crawls, touring strategies for the festival, a “new for 2015” section, and more. 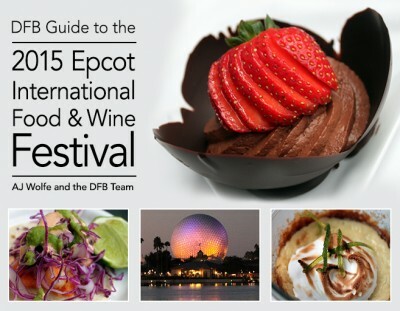 The DFB Guide to the 2015 Epcot International Food & Wine Festival e-book is an instantly downloadable PDF that can be viewed on a computer, smartphone, and/or tablet which makes for easy viewing while you’re at the festival! And right now to celebrate the grand launch of the guide, you can get $3 off the cover price when you use the code Chefs2015 at checkout! Don’t forget – booking for all special events, seminars, and demonstrations opens July 30 for the general public. Disney Chase Visa cardholders can book now as can Annual Passholders and Disney Vacation Club members. For the most up-to-date information on the 2015 Epcot Food and Wine Festival visit the Disney Food Blog’s 2015 Epcot Food and Wine Festival page.